When your dinner plate comes complete with a whole roasted bird just for your eating pleasure, you can’t help but feel like the Queen of England (or King, depending on gender and preference of course). 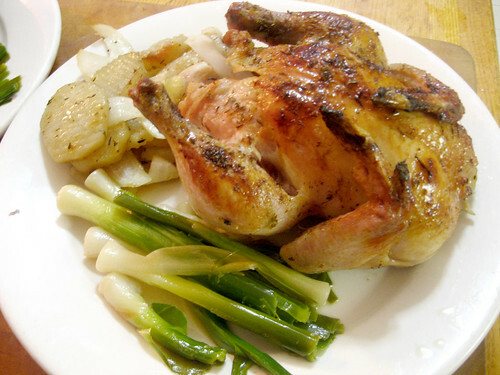 Roasted Cornish Hens with potato au jus pictured here with a side of braised leeks. The best thing about Cornish Hens are their size: small. Everyone loves personalized portions, and because they are so small, they cook faster then their larger bird-brained cousins. Cooking your hens over a bed of potatoes and onions adds flavoring and makes for a quick and delicious side as the potatoes roast in the au jus. If you only have an hour or two, but still want to host your guests to a sumptuous royal feast, this dinner is for you. And you don’t have to sell the family jewels, because this meal can be made for two for under $15.00. If frozen, defrost poultry overnight in refrigerator. Optional: defrost the hens in a brine solution overnight. The day of: preheat the oven to 375 degrees. Slice your potatoes. Since we’re roasting these, you want them to be thick enough to hold their shape. You can see I’ve cut mine in the pictures above to be about 1/4″ thick. 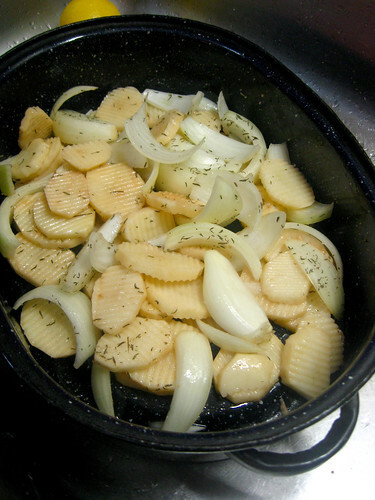 In your roaster, mix the potatoes and onions with 1-2 Tbs of olive oil, 1/2 tsp thyme and a pinch of salt and pepper. Lay the potatoes and onions out evenly. Set aside to prep the hens. 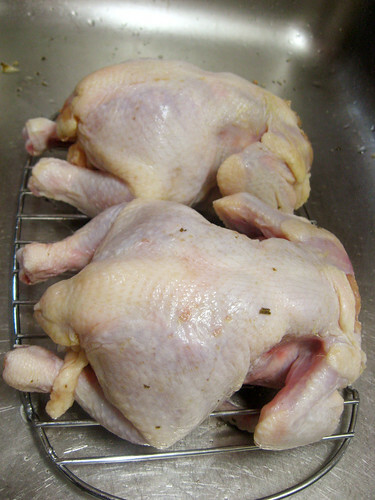 Rinse the defrosted hens in cool water and pat dry with a cloth or paper towel. Lightly salt and pepper the cavity. Take your limes and remove a tsp of zest from each and set zest aside. Using a skewer or fork, puncture a few holes in the lime throughout. 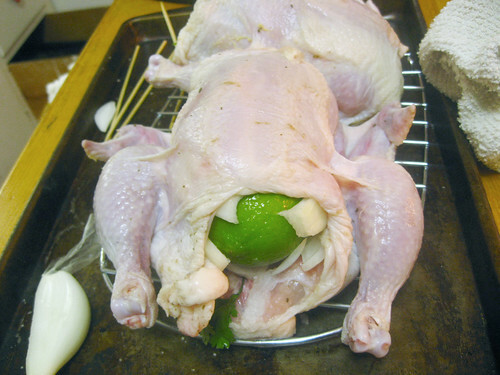 Stuff lime into the cavity of the hen along with a few slices of onion. Rub salt and pepper on the outside skin of your birds. To finish the bird, you can truss the hens with string in traditional fashion. However, I have a bunch of bamboo skewers left over from our wedding bar, so I’ve just been using these to skewer the birds together. First I skewer the cavity shut. Then above that, I skewer the left leg and then through the Pope’s Nose and then through the right drum stick. Finally I pull the two wings above the bird and skewer them together as well. Easy! 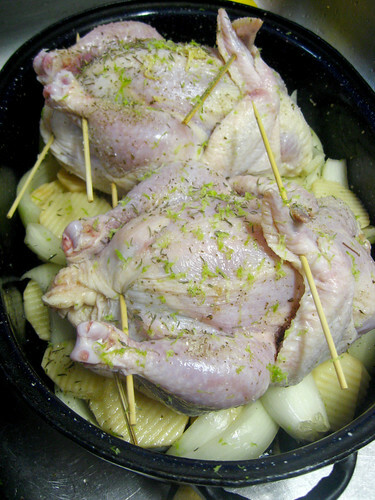 Finish the birds off with the lime zest sprinkled on the skin. Set hens over the potatoes in your roaster. Roast in oven for 45-60 minutes. At 30-40 minutes, I like to brush on a bit of fruit jam or syrup to act as a quick glaze and give the hens a nice color. Remove hens from oven when a meat thermometer inserted near the thigh reads about 150-160 degrees and the juices run clear when you cut between a leg and thigh. While your hens are roasting you can finish your dinner off with a quick side like the braised leeks pictured above or steamed broccoli. This is easy and delicious. Perfect for special occasions. I made this for Ira’s birthday and we both ate like kings!